With an appetite for food and painting, Laurel Greenfield, 25, of Allston, paints pictures of her favorite foods and posts them to her Instagram @laurelgreenfield. Larger than life ice cream cones and cakes alternate with the ever-present rainbow artichoke in her feed, making it unwise to scroll on an empty stomach. Tummy rumbling, we chatted with Greenfield about her work. A. For me it’s always been the obvious go-to for my art. It’s the way I capture my most meaningful memories. Food is really tied to my family. I come from a big Jewish family who is very food-obsessed. My whole childhood was structured around the Food Network and going to different places and going as a family to restaurants. Q. With a fridge full of options, how do you decide which foods to paint? A. Sometimes I try to think about specific favorite memories. You’ll see a lot of artichokes on my feed and that one is a symbol that reminds me of my mom and my sister, patiently steaming an artichoke and making dip to go with it. I’ll pick things that have a specific story to it, and other times I just pick something that catches my eye. I’ve been doing a lot of cakes lately because I have a huge sweet tooth. Q. 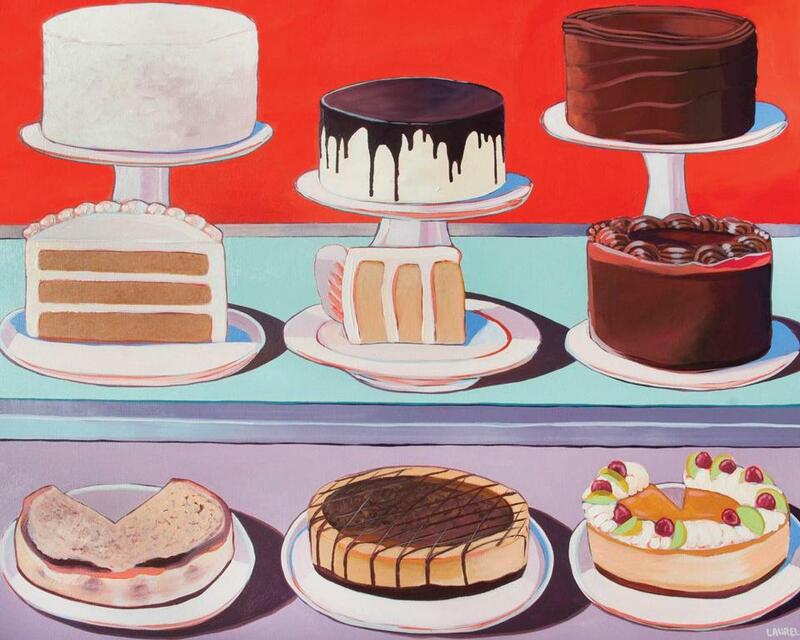 Speaking of having a sweet tooth, do you have a favorite food that you like to eat after you paint it? A. I like to paint artichokes, but not eat. I lean towards sweets, and I love ice cream so much. Q. What’s your favorite flavor of ice cream? A. My favorite flavor at the moment is the Talenti double chocolate chip gelato. Q. Why did you decide to post your work on Instagram? A. It was the best way for me to share my work with the greatest amount of people. It’s such a great platform for sharing images and having everything in one place, as opposed to a website where things are all over. It was a natural fit. Q. Does the artist community on Instagram ever blend into the foodie community? A. Most of my Instagram interactions are with the food blogger community and food photography community. There isn’t a whole lot of overlap in the two, but I love my foodie community. I graduated from the Boston University gastronomy program, so I have a master’s degree in food, which is very fitting. Q. How does your textbook knowledge of food influence your artistic knowledge when it comes to your paintings? A. It gives me a great vocabulary to talk about why food is so important. My whole life, I knew food was important to me, but I didn’t really understand why. Going through the gastronomy program, we talked a lot about food and memory, food and nostalgia, and I started to see why food was so important to me and how important it is to everyone and I use that when I paint.